Lincoln 82050 model is an air operated chassis pump designed to pump low and medium viscosity materials (grease) from 120 lb. drums and pails. This pump can develop 7500 PSI working pressure at 150 PSI maximum incoming air pressure. INCLUDES PUMP ONLY, NO ACCESSORIES. 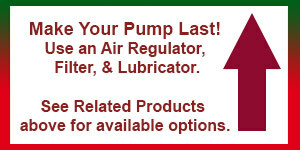 See bottom of page for Grease Pump Kit options. Model 602134 Filter/Regulator with Gauge - 1/4"
Lincoln 82050 model is an air operated chassis pump designed to pump low and medium viscosity materials (grease) from 120 lb drums and pails. This pump can develop 7500 PSI working pressure at 150 PSI maximum incoming air pressure. Minimum Air Pressure: 30 p.s.i. Maximum Air Pressure: 150 p.s.i. Maximum Output Pressure: 7500 p.s.i.